I always thought Kent Mansley was a great antagonist character in Iron Giant, which is one of my favorite Warner Bros animated films. Anyway, I though he’d make for an interesting Monday morning doodle. 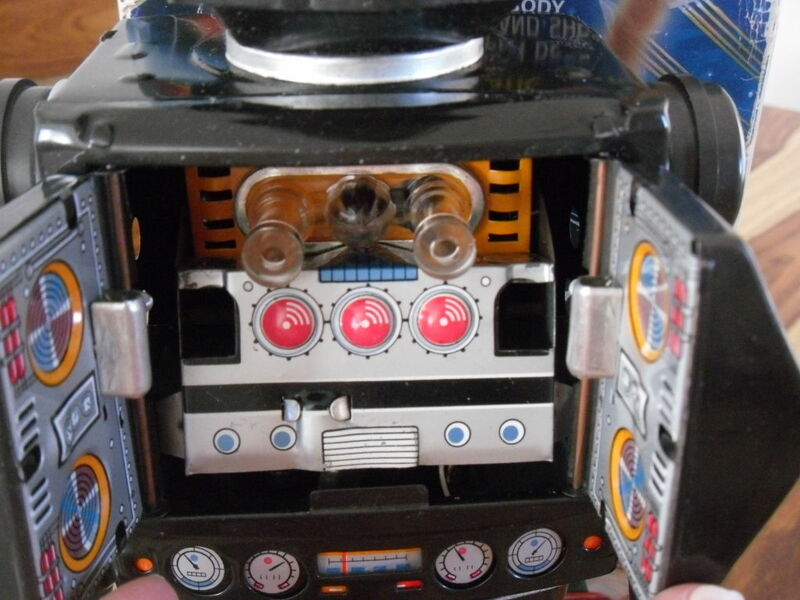 Speaking of robots, I recently came across a listing on ebay of the same robot toy I had since I was a wee lad. 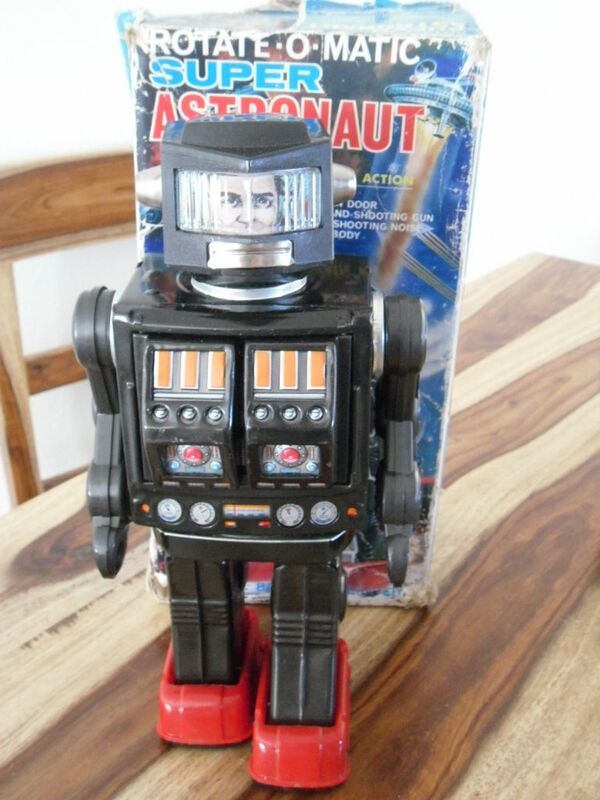 It was probably the only toy I had kept from my childhood. Unfortunately, there was a time in life where I needed cash and I trusted a co-worker (whom I hardly knew) to sell it for me. Well, I never saw that co-worker after giving him my robot and I never saw a penny from it. So I lost the coolest toy I had from my childhood and I’ve regretted it. Well, it’s only a dumb toy, so I really don’t regret it that much. But it would have been cool to still have something like that from my childhood. Kind of like when people keep their first teddy bear, only in my case it was a robot whose torso spun around 360 degrees with it’s chest-panels popped open and two laser-gun barrels went in and out, making shooting sounds and blinking lights. Heck, that would be a cool toy today, much less back in the 60’s when this metal toy was made. Here are a few pictures from the ebay listing. Mine was exactly like this one. I can’t believe this thing sells for around $100-300 today, depending on condition. 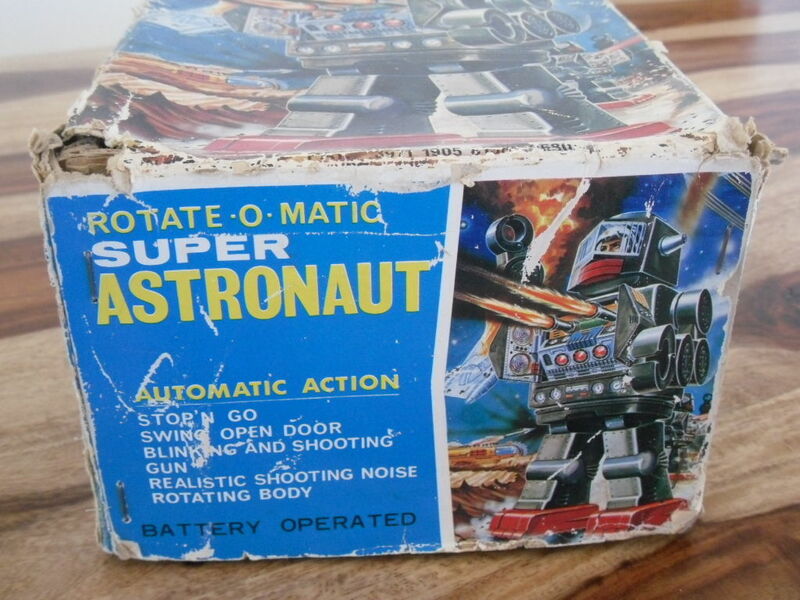 Yeah, that “Rotate-O-Matic” isn’t a feature you get on today’s cheap, plastic junk. This baby spins from the hip. On another note, the last day of the Comic Con was today (well, yesterday, if you’re reading this on Monday morning when this post goes up). I only decided to attend the Con on preview night this year. The only thing I picked up while I was there was Mark Schultz’s “Storms At Sea”, an illustrated book which I’ve been waiting for him to complete for the last half-dozen years or so. I was surprised to find that the art was just pencil renderings because these renderings were labeled as “studies” in his other sketchbooks. I suspect he decided it would take too long to actually finish these in ink and just decided to release the book with the graphite renderings. I’m happy to say that I’m not disappointed because Mark’s graphite studies are quite elaborate, and I tend to enjoy them just as much as the inked versions. The text in the book wasn’t much of a real story, but was actually a sort of convoluted sci-fi history of earth, which I found to be a mixed bag of one-world/Illuminati-type conspiracy theories, darwinism, and anthropogenic-global-warming propaganda. I was hoping for a real detective adventure, which I’m sure Mark could have written had he wanted. Instead I think he chose to go into this kind of narrative as an excuse to draw all the cool things he did, which I think is okay if that’s the only way we could have gotten all of this great artwork. If you haven’t seen Mark’s work, this would be a great book to introduce you to his art. Incidentally, every time I see a sailing ship in that position which you can see on the cover illustration above of “Storms At Sea”, I tend to suspect the artist was inspired by Howard Pyle’s 1905 painting, “Attack on a galleon”, which was also borrowed by Gustaf Tenggren and Frank Frazetta for their respective works. At least Mark Schultz is in good company. You can see Pyle’s painting below as well as those he inspired. 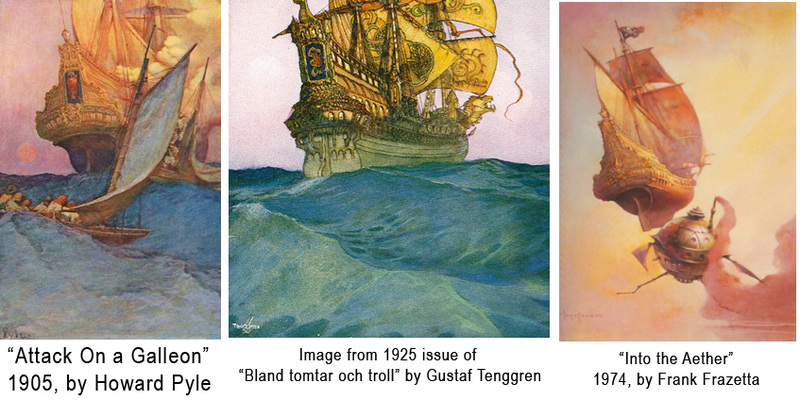 You can see how Tenggren loosely borrowed the same general wave pattern in the water as well, while Frazetta stayed pretty true to the rear view of the ship (I’m sure there’s some proper nautical term for that part of the ship, but it’s late and I’m currently too lazy to look it up). I always enjoy spotting these kinds of inspired details. My kids have been creating their own games on Scratch, the MIT site designed to teach principles of programming to children. One of my daughters has been particularly dedicated to trying more complex things, so I told her I would illustrate assets for her to create a scrolling game. I illustrated and articulated this character in different positions used to create a simple frame-by-frame animation. Because there will be quite a few to produce (and as I’m just doing this on my spare time), I have to make each asset a basic design. However, being able to help my kids be creative is really fun and I’m looking forward to seeing her develop her talents. In 2008, a local comic dealer, Chris Peterson, shut the doors of his shop, The Comic Bookie, for good. Around 2009, he ended up starting a monthly comic & collectible show at the Packing House (aptly named, because it used to be a packing house and was, in recent years, converted into retail shops and restaurants) in the Claremont Village. At the time, he needed someone to help keep an eye on his booth when he had to attend to business pertaining to the show, so I agreed to help. I would sit there and sell a few sketchbooks, but mostly I just sat and doodled all day. The following sketch was one of those doodles, which I later colored and submitted for entry into Spectrum 17, an annual featuring the year’s best (according to that year’s jury) contemporary fantastic art. So this is the original blue-pencil doodle. 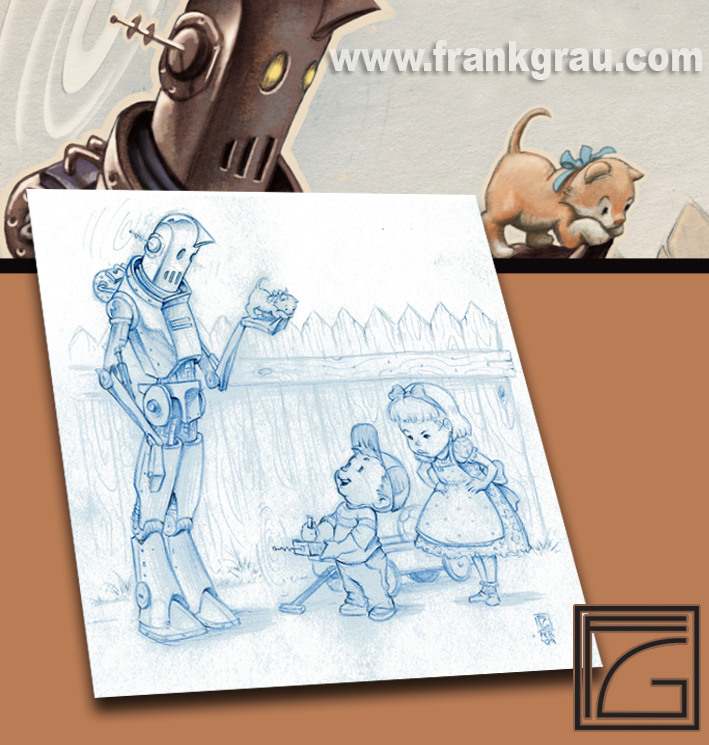 You can see the finished illustration on page 204 of Spectrum 17 (published in 2010). As you can see, part of the image also currently serves as the header to this blog.